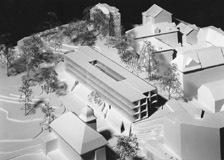 The practice was invited by a Zurich-based real estate company to submit proposals for a limited design competition with only 10 participants. The company plans to build a luxury apartment complex on a large parkland site in downtown Zurich. The building comprises two slightly offset parallelepipeds that enclose a charming inner courtyard. The apartments created by the straightforward composition offer high flexibility in terms of room count while admitting daylight on all sides. The structural members are located along the axis of each parallelepiped. This opens up a wide range of options for furnishing the apartments and guarantees absolute freedom for the facade design.